For all the talk of Mesut Ozil and much talked about pictures it is another that perhaps reveals the most of all. After Germany crashed out of this summer’s World Cup in the group stages, Ozil posted an image of himself walking off of the pitch with a camera crew in his face. “I’ll need some time to get over it” read the caption alongside the hashtag “say no to racism.” It was the first time Ozil had used it but it wouldn’t be the last. 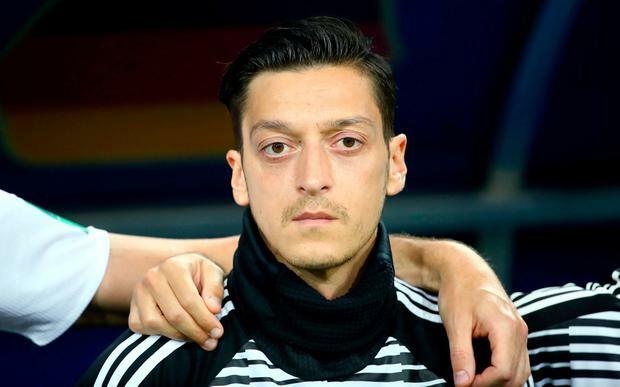 Criticism is nothing new for Ozil and he has seen plenty ever since May when a picture emerged of the player and fellow German international Ilkay Gundogan meeting Turkish president Recep Tayyip Erdogan in London prior to the tournament. While Gundogan quickly attempted to dampen the rising wave of negativity against the pair, Ozil chose to remain silent and in that vacuum his critics returned renewed once he and his teammates failed so spectacularly in Russia. Social media is often a tool for athletes to court attention or fulfil sponsorship deals but at times it can too offer a genuine insight in to their lives. Just three days after his last Ozil posted again, this time a message to his girlfriend with her smiling alongside him as they enjoyed a holiday. “You make me smile even when my world turns upside down,” he wrote. The smiles looked genuine, a clear result of some seclusion from the outside world. Yet just four days later things would darken again. Speaking with Die Welt, German national team general manager, Oliver Bierhoff, threw the Arsenal star under the bus stating that Ozil’s decision to keep quiet after the Erdogan fiasco almost jeopardized his place in the squad to Russia. Two days later Reinhard Grindel, president of the DFB, piled on further demanding that Ozil must explain himself. “For me it is absolutely clear,” he noted. “Once he returns from holiday, and with his own interests in mind, he should make his views heard.” Germany had its scapegoat. Exactly two weeks after Grindel’s outburst, Ozil responded in kind claiming the meeting with Erdogan had “no political intention” before turning on the German media, who, according to the player, had used his Turkish heritage to further their far-right propaganda against immigrants in Germany. Ozil cited the contrasting tone used to describe Lothar Matthaus’ public meeting with Vladimir Putin, which received very little media criticism, before arguing that the national press had turned Germany against him. To some this may seem quite dramatic, but for Ozil it’s only the latest chapter in a turbulent saga surrounding his relationship with Germany. Raised in Gelsenkirchen as the third-generation of Turkish immigrants, his has been a career in which he has always had to spell out his commitment to the country of which he was born and raised but for many never truly seemed to fit in. In 2010, one year in to his international career, Ozil felt obliged to explain why he never sang the German national anthem. “Although I’m not singing along, I identify myself 100 per cent with Germany.” By 2015 he had began to grow weary of the manner in which his heritage was always brought up. While noting the constant use of the term “German-Turkish”, Ozil said: “Nobody calls Sami Khedira ‘the German-Tunisian’ and Lukas Podolski, Miroslav Klose aren’t ‘German-Poles.’ Many people forget that I was born in Gelsenkirchen and grew up in Germany. If Ozil feels as though he is being singled out that’s because he is. Or, at least, people of his ethnicity are. After World War II, Turkish immigrants moved to Germany as Gastarbeiter or “guest workers” to help rebuild the country. However, despite the initial plan that most would return once their employment ended, many stayed and settled down. The country tried to deny the first or second generation of German Turks full citizenship, but in 1995 laws were changed to finally award them dual nationality. Ozil, who would have been seven at the time, would have been one of the first in his family to acquire equal citizenship rights. Despite being courted by Turkey from a young age, Ozil had always been resolute about representing Germany at any level. And since his debut for the senior team in 2009, the midfielder has characterised a modern, multicultural Germany that would go on to win the World Cup with a squad full of dual nationality players. Despite Grindel’s claims in 2004 that “multiculturalism is in fact a mess”, Ozil has proved over the course of 92 games for the national team that a player can indeed, as he put it in Sunday’s statement, have “two hearts”: one German and one Turkish. The five-time German player of the year became a convenient target. Not because of his form, something he said or a poor attitude on the pitch, but because of his ethnicity. And for Ozil, a player that has always had to remind the country of his birth that he was indeed German, he could take no more.